Voicemail or Voice Mail – What’s the Difference? Home » Voicemail or Voice Mail – What’s the Difference? Now that we are well into the 21st century, voice-messaging services should be familiar to most phone users. These services have gone by various names over the past few decades, as have the systems that run them. Before the widespread adoption of cell phones, most offices and many homes had answering machines. Now that almost everyone owns a cell phone or knows someone who does, users are more likely to take advantage of a service called voicemail, which operates on largely the same principle but is usually integrated into the phone’s hardware and software. The noun voicemail has two forms: the single-word version I have been using, as well as the variant voice mail, which retains separate words. Which should you use? What is the Difference Between Voicemail and Voice mail? 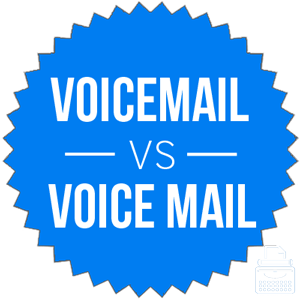 In this post, I will compare voice mail vs. voicemail. I will outline the preferred spelling and provide example sentences to illustrate its context in the English sentence. Plus, I will show you how to use a helpful memory tool that makes choosing voice mail or voicemail a little easier. What does voicemail mean? Voicemail is a noun that refers to an audio message recorded when a phone call is not answered. If someone calls you on the phone, but you are busy and cannot answer, the caller can leave a message on your phone’s voicemail system for you to listen to later. I don’t like answering phone calls, so when someone calls me, I let it go to voicemail and only call back if it is important. Kari called Jack and left a voicemail asking him if he wanted to get bubble tea later in the evening. The term voicemail has been in use since roughly 1980, when answering machines and other systems became widely available for individual and commercial subscribers. Voicemail is still an important communication tool in professional settings, alongside email and texting. What does voice mail mean? Voice mail is an alternative spelling of the same noun. Surprisingly, it sees more print use than its one-word counterpart (as of 2008). This chart graphs voicemail vs. voice mail across English books since 1800. As you can see, these words exploded onto the scene in the 1980s. As recently as 2013, AP Style was prescribing the two-word voice mail. They reversed this in 2016, making the word voicemail. This follows other style guides and dictionaries, most of which now compound the word. I suspect that the above chart is somewhat out-of-date. Ten years is a long time when dealing with technological terms. I suspect that the two variations are much closer in today’s usage. Like many English compound words, this one started out as separate words before evolving into a single word. Still, an early patent used the compound form voicemail, and today, most companies who offer such services also use the single-word version of this term. Even though voice mail has been in use for many years, the standard term today is voicemail. Unless you have a very good reason not to do so, you should use voicemail. Since voicemail and horsetail are both two-syllable compound words, and they rhyme, it should be fairly simple to remember that voicemail is best left as a single word. Is it voicemail or voice mail? Voicemail is a noun for an audio messaging system. Voice mail is the original spelling but is now an outdated form. In keeping with the traditional pattern, today the compounded voicemail is the standard form. Do not use voice mail. 1 What is the Difference Between Voicemail and Voice mail? Layout or Lay out – What’s the Difference? Aeroplane vs. Airplane – What’s the Difference?